Life for any child with dyslexia can be challenging, especially at school. If they are lucky, they end up in the right school or they have dedicated parents determined to ensure they get the support they need. When the child has a special talent as well, that dedicated parent is even more needed to make sure they get both educational support and they are also there to help their son or daughter make the most of their gifts. I know a mum just like this, Suzanne, whose son went to the same specialist school as my boys. Her son, Jumaane, excelled at sport but I discovered he wasn't the only athlete with dyslexia in his family. 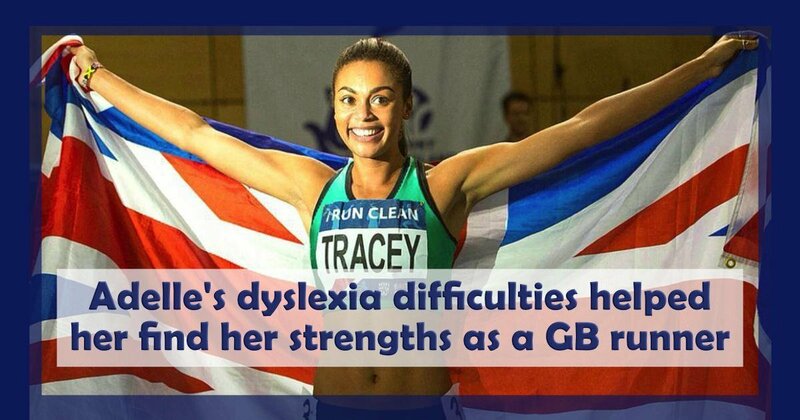 His older sister, Adelle Tracey, now 23, struggled with dyslexia at school, but on the running track she was unstoppable. 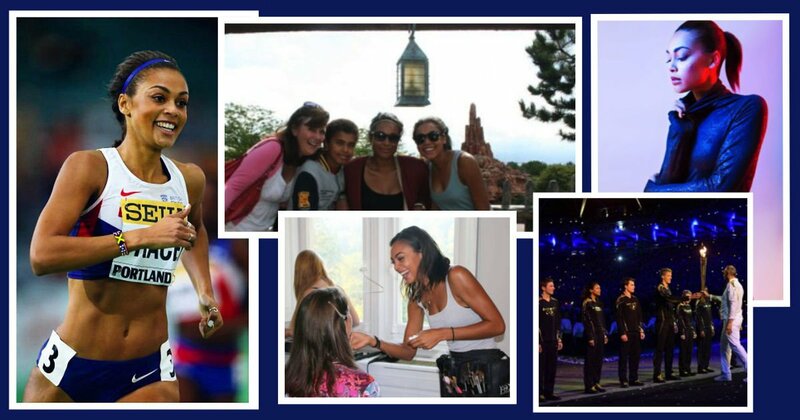 She is now a professional 800m runner, who has represented her country on a number of occasions. Adelle is a stunning young woman and a Nike sports model. She's also a qualified hair & make-up artist and a recent Sports Science graduate. At the 2012 Olympics, Adelle was nominated by Dame Kelly Holmes, to help light the Olympic cauldron flame as a future potential champion. She is the current 800m British Indoor Champion and her aim for 2017 is the World Championships in London and then the 2020 Olympic games in Tokyo. Today she's sharing her inspiring story and I hope it will show other young people that despite their difficulties, they can succeed. From a young age, I’ve always had a very creative educational experience. I have worked hard to overcome my difficulties and follow my strengths. Growing up in Jamaica I was homeschooled from about 4–7 years old with the local children. My mum, along with the some of the other parents, ran a ‘school’ called ‘Leaf of Life’, which I loved. I can remember growing and measuring sunflowers for maths and painting murals on the tables in art. I enjoyed school and didn’t see it as an effort back then. When we moved to the UK where my mum’s family lived, I started primary school in Year 2. Immediately, I felt as though school wasn’t as fun as it had been previously. Teachers would call you out and ask you to answer questions because you appeared to be non-interactive. I’d feel embarrassed as I never followed or actually knew any of the answers. This only made me become more of a shy and introverted person when I was young. My mum took me to Helen Arkell Dyslexia Centre when I was seven, to have an educational psychologist assess me and I was diagnosed with dyslexic and dyscalculia. Luckily, I was in good company as my mother is dyscalculic and my sister and younger brother also have special educational needs. Although after being diagnosed I had added support at school, my mum knew this might not be enough, as even though I was seven, I still could not read. She sent me to a tutor once a week. Although I struggled to concentrate and found sessions extremely tiring, I loved Jenny (my tutor) as she was passionate and I felt she took the time to help me to understand and break things down. My mum encouraged the aspects she knew I enjoyed, such as the arts and sport. I started performing with a theatre group where I sang, acted and dance in various show and even went on to audition for West End shows. After my first school sports day, I remember feeling good because I’d beaten all the boys and it was nice to be good at something. After that I fell in love with athletics. I watched my sister train at the local club every week, itching to have a go myself but I was too young. I joined a running club at school that the maths teacher, organised. We’d go running at lunchtime and once a year competing at the Chichester road races, which I loved! Alongside running and performing, my mum always encouraged art. I would go to workshops in the summer and at weekends with my grandmother who was very arty herself. I felt like all these things gave me confidence as a maturing person and made me feel like I was good at things, which I often didn’t when I started school in the UK. All through school, I carried on pursuing these activities outside of school and away from studying, pursuing my strengths, made me more and more confident because I felt successful. It was difficult to balance the thing I loved and wanted to do with my studies when it came to my GCSEs so I chose to drop acting and dance, although I still studied drama as a subject. I carried on running though and by the time I took my GCSEs I was selected for my first athletics GB team, getting a silver medal at 800m the European Youth Olympics in Finland. "I know that I wouldn’t have been able to accomplish my dreams without the struggles I endured. My difficulties helped me find my strengths and think outside the box." I honestly think my running helped facilitate my learning. It gave me a chance to take a step back from studying and forget whatever stress I had and focus on something I was good at. I worked extremely hard during my GCSEs coming away with As &amp; Bs in art, PE and drama but the grades I was most proud of despite them not being quite as high, were my C in triple science, C in Maths and B in English. I enjoyed Sixth Form much more than school, purely because I could control what I chose to pursue. I chose all art subjects – Textiles, Drama, Art &amp; Photography. Naturally because of this, I wanted to follow a career in the arts along side my career as an athlete. I knew this would be difficult as both fields were extremely full-on. Although education was challenging, I now look back having done two degrees in five years of continuous study. The first degree in Make-up and Prosthetics and the second in Sports Science, which I never thought would be the case, and I feel proud. I am now in my dream job, as a full-time athlete working part-time self-employed as a make-up artist &amp; hairstylist when it fits in around training. I know that I wouldn’t have been able to accomplish my dreams without the struggles I endured. My difficulties helped me find my strengths and think outside the box. Dyslexia never goes, but we can find ways of overcoming day-to-day struggles, like now, I know I will have to send this to my mum to proof-read before sending on! I’ve learnt over the years after being asked the time on several occasions, never to leave the house without my digital Casio. I’ve always struggled to tell the time on an analog clock and by the time I’ve worked it out it's normally changed! Even now, during driving lessons I have to right ‘L’ &amp; ‘R’ on each hand in bold capitals to remember my left and right on navigation. Sometimes when I’m speaking to people my processing takes a while to catch up. Someone will ask me a question and I’ll say, “Sorry, say that again?” and then it hits me. I always find this amusing that I couldn’t hear what was asked right away and yet a split second later it comes to me. At training if my coach ever sets me mile reps on the track, I’ll have to consciously think “how many laps is that?” which is ridiculous for someone who runs miles everyday. That’s the funny thing about special educational needs, it always catches you off guard. One memory I have is when I attended a job interview at a well-known clothes store. I was totally embarrassed when they asked me to read the story of the company founder from a PowerPoint. It was a group interview and I’ve always found reading difficult but without rehearsal almost impossible, especially with an audience. I am ashamed to say I lied and said I needed my reading glasses! It seemed to be the best excuse at the time and it worked! However afterwards I thought to myself how unfair it was to put someone in that position. Especially when the role didn’t require me to read at all! Having special educational needs has taught me to always overcompensate, be disciplined and determined and confident when it comes to my weaknesses. I barely even notice the things I do to overcome my difficulties day-to-day because they are so ingrained in me now. One thing I know is that I feel lucky to have had the support and guidance of my mum who has always fought my corner to make sure I had the support I needed to be successful. I know there are people who might not be aware of their difficulties and therefore question their intelligence, which is something I experienced as a child but I hope that reading this perhaps they can relate in some way and find strength to overcome their individual challenges.